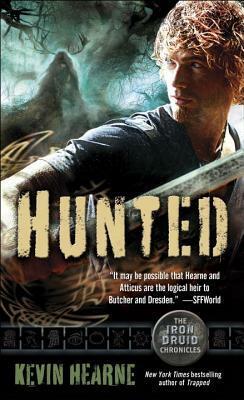 Just how I like this series..... Presenting The Iron Druid Chronicles #6 Hunted by Kevin Hearne. Celtic, Greek, Roman, Scandinavian, Slavic, Indian and every other myths and lore beautifully mixed and matched and given the modern touch through the talented pen of Kevin Hearne. Add to that the marvelous execution of humor(normal, dry and dirty) and clever use of trivia makes it an urban fantasy worth its while. Hunted is designed to keep you on your edge, danger is always following Atticus, Granuaile and Oberon and you don't take that lightly when its some of the most powerful Gods behind you...... This book was everything I have come to love about the Iron Druid Chronicles, its intense action, its drama, the myths, legends & lores, the humor, the trivia..... and the most important the thrill of the chase...... Never dyll moment thanks to Mr. Hearne here.... never one second of dull. "Exhilarating chase across the continent, the coming apocalypse and the alliance of the Gods. YOU CANNOT MISS IT"
OOh nice review! Need to get me this one since I finally got caught up with the rest! Love the summary and the review! Also, Norse and Greek mythology? I'm in. Great review. This sounds like a good book. I enjoy mythology.